It's not terribly inspired, but it's food! ;o) I had planned on making her pasta salad but went to bed last night instead. 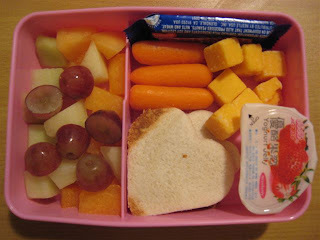 She has mixed fruit salad, a heart & flower shaped sandwich, some cheese, some carrots, a yogurt jelly & a Nestle Crunch bar for a treat.